GUESS WHAT?! As you know, I have been making the matching cowl of this beanie and you have no idea how excited I was when I was able to make both with ONE skein of yarn! 2 projects in 1 that have such a cool design for basically under $7...AMAZING, right?! Let the Christmas present making BEGIN! -Size 5 bulky weight yarn - 61 yds. | I used Bernat Roving in Putty. Patons Roving is 100% wool-same weight yardage. A great alternative if you want something to keep you extra warm! This Cowl is made in the round starting at the bottom up. 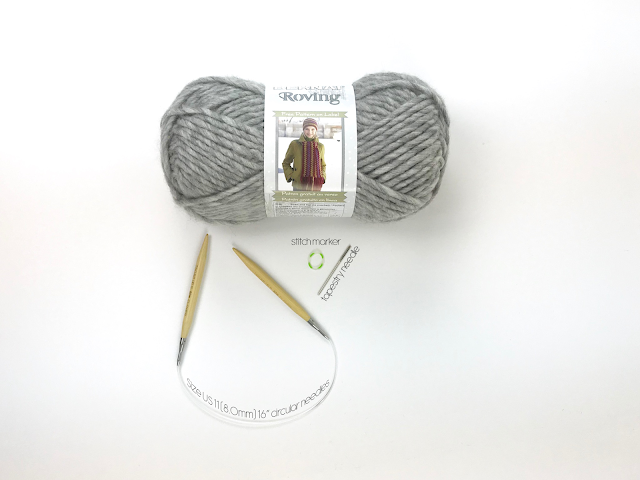 Note: Because the fisherman rib stitch stretches a lot, you need to cast on and bind off with double the amount of stitches in order for it to fit on your neck. Repeat Rnds 3-4 until you get to Rnd 34. Bind Off LOOSELY! If you bind off too tight, the cowl will not fit on your neck. The easiest way is to bind off loosely. But if you would like to add on stitches to this next round so that the opening is larger, that is fine as well. Then you would bind off normally the next round. Cut yarn. Tie a knot. Weave Ends. Beautiful Work! Thank you very much, I will make this!